There are currently 115,028 users on this website. Looks like a counterfeit coin and slab. The label has the wrong spacing in the cert number and the font is off slightly. The coin itself looks like it would grade at least MS67 if it were real. That's what I thought, but since I wasn't familiar with them was going to ask first. Was being sold for 999 AUD which was a red flag for me. 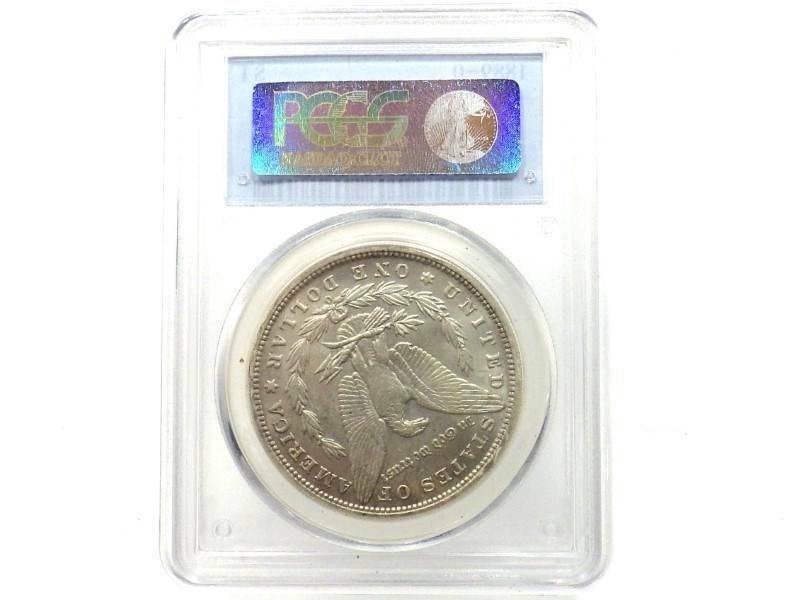 Worries me that someone realise they could fake a PCGS coin since there wasn't any photo of the actual coin on PCGS site. So I didn't know that the Zero mint made dollars in 1889. LOL that font is so wrong. Also, usually, when I see a picture of a slab, I take a screenshot and of the barcode and use an online barcode reader to see if it matches up. The code on the slab pictured does not compute. This could happen with a genuine slab as well when the picture quality is poor, but is another strike against this one. So the slab is fake, with a "borrowed" cert number, the coin is almost certainly fake as well. Looks fake. Make a call, In the United States call toll free at 800-447-8848, give them the site location and let them look at it. They probably need to know about it if someone has stolen their cert number. IMHO. 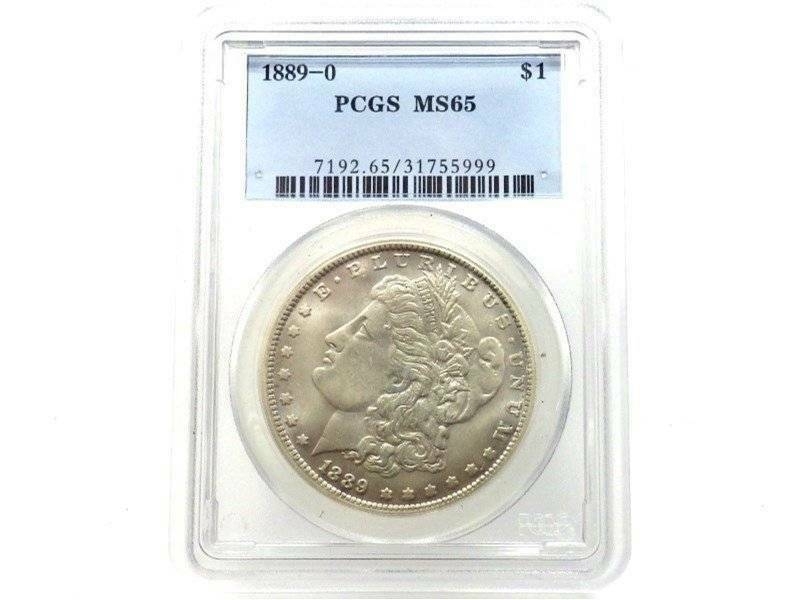 Don't call PCGS about it, they're aware that it happens and would be swamped with calls all day long if people called in every time they saw one of these. This being the second one on here I've seen in 24-48 hours, it gets me thinking. How do they obtain legit cert numbers? They could start with the coin, look at auction websites, find one for the year/mint/grade, but this seems too labor intensive given that they seem to be doing every denomination/year/mint/grade. I'm thinking they scrape the PCGS website and have accumulated a duplicate of the PCGS database, or just hacked in and stole it all at once. But with that level of sophistication I'd think they would get the fonts and barcode correct. Heck, I did a system to print barcodes off a database 25 years ago. I guess we're lucky so far that these people aren't the sharpest tools in the shed, but it's only going to get worse. How do they obtain legit cert numbers? They could start with the coin, look at auction websites, find one for the year/mint/grade, but this seems too labor intensive given that they seem to be doing every denomination/year/mint/grade. I'm thinking they scrape the PCGS website and have accumulated a duplicate of the PCGS database, or just hacked in and stole it all at once. But with that level of sophistication I'd think they would get the fonts and barcode correct. Heck, I did a system to print barcodes off a database 25 years ago. I guess we're lucky so far that these people aren't the sharpest tools in the shed, but it's only going to get worse. You're way overthinking it again. It takes 10 seconds to find certs online, there's no need to hack anything. A lot of the PCGS counterfeit slabs are made in China, and they target PCGS cert numbers that do not have a photo or a link to a auction photo on cert look up. As Basebal21 notes it is easy to find cert numbers online, on eBay a PCGS coin search can be done by date, mint mark and grade. PCGS has announced that they are going to be taking photos of all certified coins in the the near future, but the TPG's are going to have to improve slab security to stay ahead of the counterfeiters. True they can just do a search, and even if they aren't good at English they can use Baidu translation tools or WeChat. Opinion on contacting this seller (OP shop/pawn shop)?